im sorry but how do i get these to work? Hi shadow93 and welcome to the fouums. I am not sure how much experience you have with editing etc so ill try and explain all. You will need to do whats known as "unpbo" the file you downloaded or in itonfronts case "unifa" both mean the same thing. The file you downloaded has a file extension of .ifa that works as is by the game when you load it as a mission to play. But to edit that file and have a look at it in the editor you need to extract the file. To do that this tool that you will need to download and install works well. 2. Once installed, open it. In the top left corner there is a green icon with a white down facing arrow on it, press that. 6. Select the 3rd option "Extract to "the file name etc"
7. You will see a progress bar on screen. Once complete the file has been "unifa'd" and you will have a standard windows folder with the same mission name in the same location as the original ifa file (so you don't lose the original file) PBO manager can now be closed. 9. Once the folder has been moved to the new location it can then be opened in the single player editor. 10. In the editor you will see that each playable unit has alot of code in its init box, this is all required to get the textures to work. So this has to remain un edited. 11. In the folder that you unifa'd there are 5 .paa files and a folder called retextrespawn, they are the files/folders that are required for it to work. 12. To use this lot in a mission of your own:- Open simons mission and copy the playable units over to your mission. Copy the 5 .paa files and the retextrespawn folder from simons mission folder in to your mission folder and that should be it. Once simons units are copied from one map to another they will need to be set as playable or player again. Sounds good Simon! All your work would be very much welcome as addons! I also like that idea very very much. I feel terrible to bash you with this but...After maybe 101st with helmet netting? Again, not a big deal. Just the 2nd on their own would be splendid. If you want to do something in case of the net on helmet, I suggest to contact with Joarius. His nets look really good. What were the nets used for exactly? to break up the solid color or shape of the helmet? Or to have the option of being able to stick branches and what not in the holes of the net to help aid in camouflage netting? Or to have the option of being able to stick branches and what not in the holes of the next to help aid in camou netting? It is used to make it less shiny and to break up the obvious shape of the helmet a bit. It also adds the possibility of swiftly adding branches etc as extra camoflage, which is convenient as adding "live/local" camo can be better than a general cover. can we have that update also as "pbo" for addon-folder ? Actually, i don't have time to learn how make a real addon. 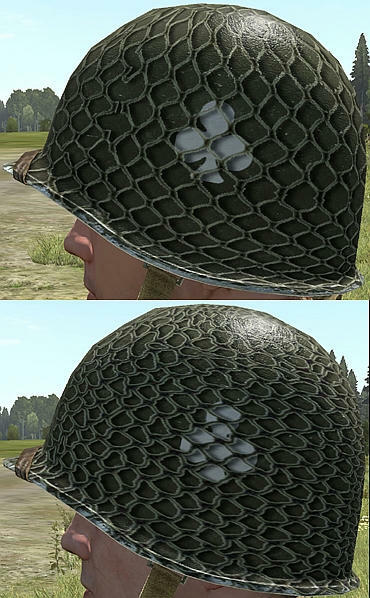 This helmet are simply commands for textures with this setObjetTexture.